Packing for your family picnic is easy and fun with the Picnic Pack Deluxe Water Resistant Picnic Blanket. This large blanket will allow for a spacious spread of drinks and sandwiches for the whole family's trip to the park, but it is also cozy enough for a private romantic moonlit meal for two. The water-resistant bottom prevents dew from seeping through, and the whole blanket folds into a package with a carrying handle and shoulder strap for easy transport. WATER AND SAND PROOF BACKING. Perfect for picnics, beaches, camping, parks or concerts. DURABLE AND LIGHTWEIGHT. Weighs less than 2 Pounds. EASY TO CLEAN. Spot clean or cleaned by damp cloth. If you have any questions about this product by Picnic Pack, contact us by completing and submitting the form below. If you are looking for a specif part number, please include it with your message. 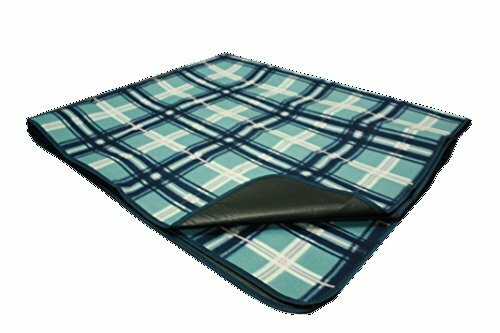 (2) Foldable Beach, Picnic Blankets, Water and Sand Resistant folds compactly, large 72"x59", durable, light and handy mat to keep in a car. (2-Pack) Perfect for all your Outdoor Adventures!